Summary: A new historical novel from Pamela Schoenewaldt, the USA Today bestselling author of When We Were Strangers. Italy, 1905. Fourteen-year-old Lucia and her young mother, Teresa, are servants in a magnificent villa on the Bay of Naples, where Teresa soothes their unhappy mistress with song. But volatile tempers force them to flee, exchanging their warm, gilded cage for the cold winds off Lake Erie and Cleveland's restless immigrant quarters. With a voice as soaring and varied as her moods, Teresa transforms herself into the Naples Nightingale on the vaudeville circuit. Clever and hardworking, Lucia blossoms in school until her mother's demons return, fracturing Lucia's dreams. SWIMMING IN THE MOON tells the story of Lucia and her mother Teresa. In the early 1900s, they are servants in a villa on the Bay of Naples until one tragic day when Teresa's temperamental behavior forces them to leave the country. Their friends help them find a new home in the immigrant parts of Cleveland. Teresa no longer wants to be a servant so she tries her luck on the Vaudeville circuit leaving Lucia behind. Lucia is an excellent student and thriving in her new home until her mom's volatile behavior returns. Lucia is torn between finding happiness and success while trying to save her mom. Lucia discovers that she isn't the only one pursuing the American Dream. Things are hard for immigrants. Fair wages and working conditions are hard to find, and Lucia finds herself joining the battle. Ultimately, she faces much risk and potential reward; and through the entire process she also learns a great deal about her own search for happiness. Once again, Ms. Schoenewaldt wrote a book that really captured my interest and held it. 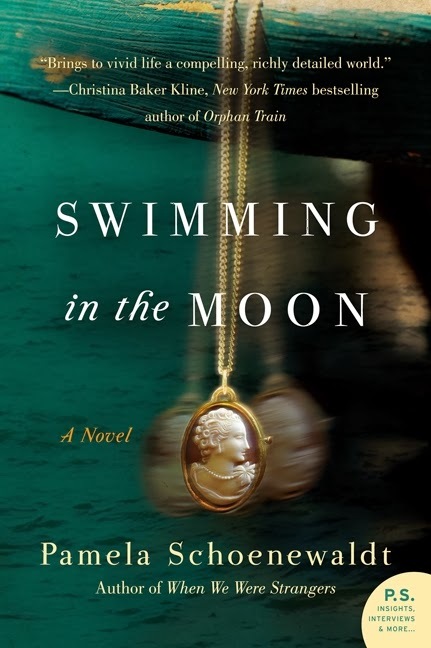 I enjoyed SWIMMING IN THE MOON a great deal, and I especially enjoyed the blend of history and fiction. As an almost purely reader of fiction, I like when I can read an entertaining story and also learn a thing or two. And in the case of SWIMMING IN THE MOON, I learned quite a few things about the early labor movement in the United States. The author included many actual events from the labor movement including the 1911 Triangle Shirtwaist Factory Fire, and I thought it was evident that she did a great deal of research to write this story. In addition, I really appreciated how this novel explored mental illness. Lucia's mother Teresa was dealing with quite a few issues that there is medication for in today's society. However in the early 1900s, mental illness was treated quite differently especially if you were a poor immigrant. I liked getting an inside view in early mental institutions as well as their some of their practices including forced sterilization. It really is difficult to think of how we treated these individuals in our country, and it wasn't all that long ago. Another aspect of this novel that I enjoyed was how well Ms. Schoenewaldt brought her setting to life. She chose Cleveland for this novel rather than New York or Chicago, and I actually liked that it was a little different than other immigrant stories. She did a great job of describing the city as well as the immigrant quarters, and I also thought her descriptions of factory life were fascinating. Needless to say, I'm going to recommend SWIMMING IN THE MOON for book clubs. I think it's an ideal selection because it does touch upon so many complex issues. There is a reading guide available for the novel with seventeen questions. Some of the themes you might want to explore include mental illness, the immigrant experience, change, the labor movement, prejudice, honestly, guilt, duty, education, worker's rights, and family. If you are a fan of historical fiction and especially immigration stories, then you won't want to miss SWIMMING IN THE MOON. Oh I bet I'd love this too -- the Cleveland connection interests me, the time period, the immigrant aspects. I love a good immigrant story as well. You've made me excited about this book! Really good book. I live in Youngstown, Ohio, my daughter lives in Cleveland. My grandparents came from Italy in early 1900. They settled in Youngstown and my grandmothers sister settled in Cleveland. It was great to read about real places that have been a part of my life.